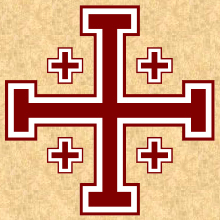 The Equestrian Order of the Holy Sepulchre of Jerusalem, more succinctly known as the Order of the Holy Sepulchre or the Equestrian Order, is a Roman Catholic order of chivalry under the protection of the Holy Father. Though the order traces its lineage back to the Duke Godfrey of Bouillon, a principal leader of the First Crusade, it was not until 1496 that Pope Alexander VI established the office of Grand Master. However, this office remained directly vested in the Pope himself until 1949, after which time a Cardinal has been appointed by the Pope as Grand Master, with the Pope remaining as the Sovereign of the Order. The Equestrian Order enjoys the protection and official diplomatic recognition of the Holy See and has its legal seat within the Vatican City. The Cardinal Grand Master's official residence is the Palazzo della Rovere, the 15th Century palace of Pope Julius II. This palazzo also serves as the international headquarters of the Order. In some branches of the Order, the term "Lady" is used rather than "Dame". Knights and ladies making a pilgrimage to the Holy Land receive the Pilgrim's Shell from the Latin Patriarch. Knights and Dames of the Order may display their coat of arms with the appropriate insignia of the order. The Equestrian Order's role is now primarily honorific. Its principal mission is to reinforce the practice of Christian life by its members in absolute fidelity to the Pope, to sustain and assist the religious, spiritual, charitable and social works of the Catholic Church in the Holy Land, and to conserve and propagate the faith in the Holy Land and the rights of the Catholic Church there. Candidates for this order must be approved by the Vatican Secretariat of State, who, in the pope's name, approves all knighthoods and officially seals each diploma of appointment. Even though it is not a papal honor, because it is a Catholic order, aspirant members must be practicing Catholics of good moral character. They must be recommended by their local bishop and supported by several members of the Order. Furthermore, they must make a generous donation as a "passage fee," as well as making an annual financial offering for works undertaken in the Holy Land. However, there is an exceptional provision that the Grand Master may admit members to the Order by motu proprio. This may be done in special and exceptional circumstances.